﻿ How to Integrate Facebook with Email Marketing » Red Mango Marketing! The leads you generate through your Facebook Business Page only drive value when you use them the right way. While collecting leads, your potential customers, is an essential step, what really matters are the steps that follow. You can give your leads something of value, or thank them for showing interest, in addition to providing the information they signed up for. This is where Facebook email marketing comes in. Lousa has put in the work to grow his Facebook following to over a thousand fans. He regularly posts updates about brunch specials, new craft beers, and open mic nights at his café. But recently, his posts have been reaching fewer fans than ever before. Is Facebook still worth his time? Despite the decrease in organic reach, Facebook is one of the best ways to make a great first impression on potential customers. When someone searches for Lousa’s café online, his Facebook Page serves as a visible online community, fully equipped with photos, business information, and a look at how the café communicates with its customer base. But what about reaching existing customers? When sites like Facebook make changes that limit your ability to reach your audience, you want to make sure you have another way to reach them directly. That’s why it’s important to move your relationships beyond social media and use Facebook to grow your email list. Email marketing gives you the power to reach your contacts on your own terms. You can send a message to your subscriber list directly and track your results to see which contacts are engaging with your content. Want to try email marketing for your business? Sign up for a free 60-day trial. By adding the Join My Mailing List App, you can collect email addresses easily and they will automatically be added to your list within your Constant Contact account. It only takes a minute to connect it to your Business Page, and you can customize the email opt-in form with your logo and a quick introduction to let your audience know what they’ll receive. Your cover photo is right at the top of your page and will often be the first thing people see. You can use this space to create an image that calls out your email newsletter. Start with one of these 15 ideas for your cover photo, and then add some text to let fans know they can stay in touch through Facebook and email marketing, as well. Check out this example from marketing expert, Jon Loomer, who offers a free guide in exchange for an email address. His cover photo provides a URL where fans can get the guide and also includes an arrow to a direct link. Facebook recently announced the call-to-action feature. This button appears near the “Like” button on your cover photo and is another great way to encourage email sign-ups through the platform. 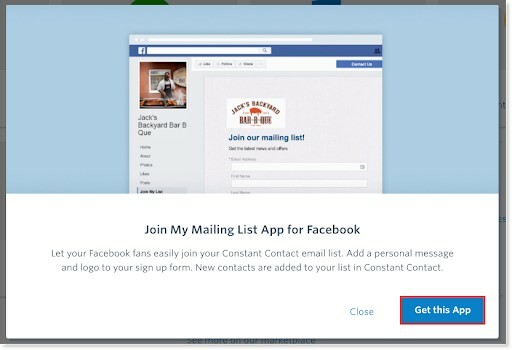 Add the “Sign Up” button and link to your online sign-up form so your Facebook visitors can join your mailing list easily. Give Facebook followers an incentive to share their email address by running a contest on Facebook. Then, make it easy for your followers to enter. You can simply collect names and email addresses to choose a winner at random, or ask your fans to provide an entry relevant to your business. For example, a pet shop could run a photo contest and ask for photo entries for the “cutest pup.” You can even ask your audience to help you choose a winner by posting the photos and asking fans to cast their vote. If your business doesn’t have a product to give away, think about what exclusive content you can offer instead. Anything from a downloadable guide on cloud computing to a link to a top secret recipe could be just the incentive your audience needs to give you their contact information for an improved Facebook marketing strategy. Whether you hold an event at your business or host an online webinar, an event is a great way to connect with your audience. Make sure you’re collecting email addresses during the registration process to keep Facebook and email marketing in sync. What better way to persuade your Facebook fans to sign up for your list than to show them what your email marketing campaigns actually look like? With Constant Contact’s Social Share, you can share your email newsletters on your social media channels, including Facebook, Twitter, and LinkedIn. Be sure to customize the caption and provide a link to your sign-up page to encourage your fans to subscribe to receive all your future messages. The right apps and email integrations improve your email marketing and allow you to keep the two in sync. A large portion of your Facebook’s user base will be accessing your page through a mobile device. While they’re on their smartphones already, let them know how they can join your list by sending a quick text. You don’t have to pay to promote everything you share on Facebook, but if you’re selective and promote posts that will drive action for your business you can see some great results. Try promoting an email and including an easy way for fans to sign up — make sure you’re taking advantage of the Facebook Ad targeting features so you know you’re reaching the right audience. A sweet and simple “Thank You” message is all it takes to make your subscribers feel special and appreciated. Begin your Facebook email marketing with a thank you note when a person goes from being a potential customer to a subscriber, and let them know your business values them. Welcome each of your subscribers by giving them a peek into what follows – emails, promotions, deals, discounts, and valuable information. You can do this automatically by building a welcome series in your Constant Contact account. Open all doors and windows. Share links to your website, blog, social pages or any other point of contact with your business. This gives your subscribers a clear indication of your credibility and that you’re easily approachable. If your Facebook email marketing contact form allows interested people to ask specific questions, now is the time to answer these questions. Don’t ask questions in the contact form if you’re not going to immediately provide answers, or else leads may walk out on you. This is quite an obvious one, right? People make quick decisions, and you have just a few seconds and a few words to grab their attention. Share exciting products, services, news, information, images, or event details – anything that would pique a subscriber’s interest and cause them to engage with you. You can do this with a consistent and informative email newsletter. Don’t just keep sharing; be open to receiving too. Be it feedback, suggestions, or a simple “What would you like to hear from us?.” Your subscribers must see that you’re open and receptive. Make sure they know how to contact you with feedback about your products or service. The biggest issue faced by both businesses and customers is irrelevancy. Just like it’s important for you to know your target audience, it’s also crucial for customers to connect with brands that understand their specific needs. How can you be relevant? Use tools like segmentation to ensure you’re sending the right information to the right people. There’s a thin line between being interesting and being pushy. Your job is to compel people to take the step from potential customer to interested subscriber. You must keep them interested, answer their questions, and, at the same time, keep them engaged. Your level of communication determines whether they choose to stay on, or move on. If you’re wondering how Facebook can have a bigger impact on your business, make sure you’re giving your fans additional ways to connect with you through direct-response digital marketing channels such as email marketing. Head to the Constant Contact Marketplace and find the right apps and integrations for your business. 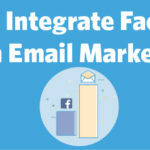 The post How to Integrate Facebook with Email Marketing appeared first on Constant Contact Blogs. This entry was posted on Monday, December 24th, 2018 at 11:20 am	and is filed under Email Marketing, Facebook, News & Updates. You can follow any responses to this entry through the RSS 2.0 feed. Both comments and pings are currently closed.